ClearOne vs Polycom. 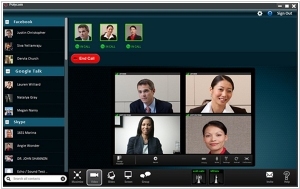 What is the best Videoconferencing software? ClearOne’s portfolio of industry-leading HD video conferencing solutions includes feature-rich room systems and desktop video applications, as well as enhanced network management and infrastructure solutions. Collaborate anywhere, anytime, with anyone using Polycom video, voice, and content-sharing solutions. One-touch ease; audio and video with crystal-clear quality; enterprise-grade security, reliability and scalability. Polycom solutions give you the flexibility to meet and collaborate with colleagues, partners, and customers in any environment―immersive theater, conference room, work office, home office, or on-the-go. Wherever you are, wherever you go. In 2009 Cisco acquired the leading videoconferencing provider Tandberg and get too much power in this market. And of course, the competitors had to do something with that. At first the rumors appeared that HP would buy the second largest market player - Polycom. But it turned out that Polycom is more interested and more solid in the videoconferencing market than HP. Yesterday Polycom announced that it will buy HP's video conferencing business for $89 million. HP is mainly focused on high-end telepresence systems, sold under the Halo brand. They will organically supplement the Polycom's mainly low-end video conferencing solutions. However, according to the market experts, the main competition will take place not between the two giants Cisco and Polycom, but between the two approaches to videoconferencing. First - is expensive hardware systems (Cisco and Polycom) and the second - cheap and mobile Internet services (Microsoft Skype, Google Talk, GoToMeeting).